IOWA CITY, Iowa (AP) — A trooper pursued an SUV that was speeding at 90 mph with Iowa Gov. Terry Branstad inside, but declined to pull the driver over after realizing he was transporting the state's top elected official, audio recordings released Tuesday indicate. The Iowa Department of Public Safety said it has launched a review of its handling of the April incident in which dispatchers, according to the recordings released to The Associated Press, laughed after learning the vehicle in question was the governor's. Days later, the department placed the investigator who initiated the pursuit, Special Agent in Charge Larry Hedlund, on administrative leave. Hedlund's attorney said Tuesday the personnel action was retaliation for the agent complaining to superiors that the trooper driving the governor was improperly given a pass after putting public safety at risk. A Branstad spokesman denied that allegation. "Did you get the wind, the word on who that vehicle was?" Hedlund could be heard asking the dispatcher in the recordings, before chuckling. "I guess my career doesn't have enough problems the way it is. It was the governor." 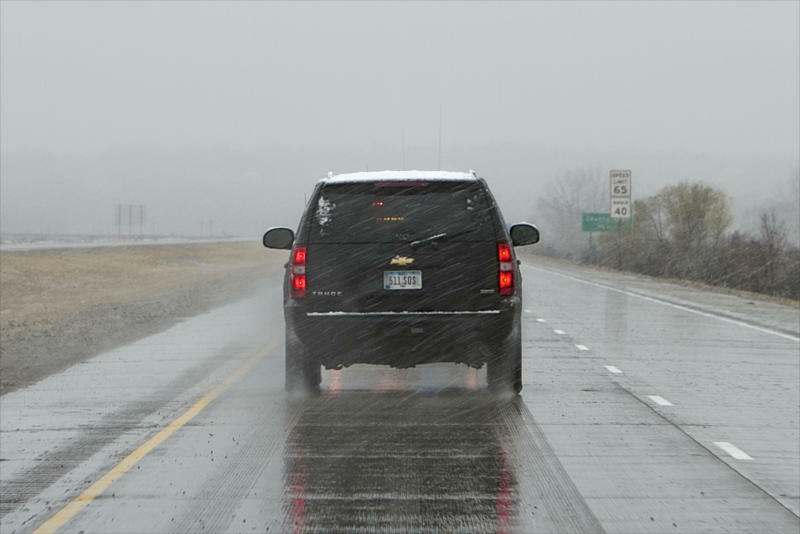 Hedlund, of the Iowa Division of Criminal Investigation, had called a dispatcher on April 26 to report a black Chevrolet Tahoe that was driving a "hard 90" mph on westbound Highway 20 near Iowa Falls. The dispatcher called for the assistance of a nearby trooper, who eventually moved to intercept the vehicle several miles away after the SUV turned onto the Interstate 35 southbound ramp. The dispatcher also checked the vehicle's license plate number, which raised suspicion when it did not turn up in a computer database. Hedlund pursued the SUV in his state vehicle for miles until the trooper arrived. Hedlund promised to be that trooper's backup during the stop. The SUV ultimately was clocked at 84 mph, over the highway's speed limit of 65. Dash camera video shows the unidentified trooper zip in and out of traffic to catch up to the governor's vehicle and pass a school bus at a high rate of speed before ending the pursuit after realizing who was inside the SUV. Radio call logs indicated it was "Car 1," a reference to the governor's vehicle. By then, the SUV had traveled through three counties and covered 15 miles. The governor's schedule shows he was returning to Des Moines after appearing at an event in Parkersburg. Branstad's driving detail comes from a state patrol unit assigned to protect the governor, first lady, lieutenant governor and other dignitaries. Lt. Rob Hansen, spokesman for the Iowa Department of Public Safety, which includes DCI and the patrol, said the department is reviewing the incident as part of a personnel investigation. He said trooper Steve Lawrence was driving the governor, and trooper Matthew Eimers was the one who responded and let him go. Hansen said troopers can be ticketed for speeding. 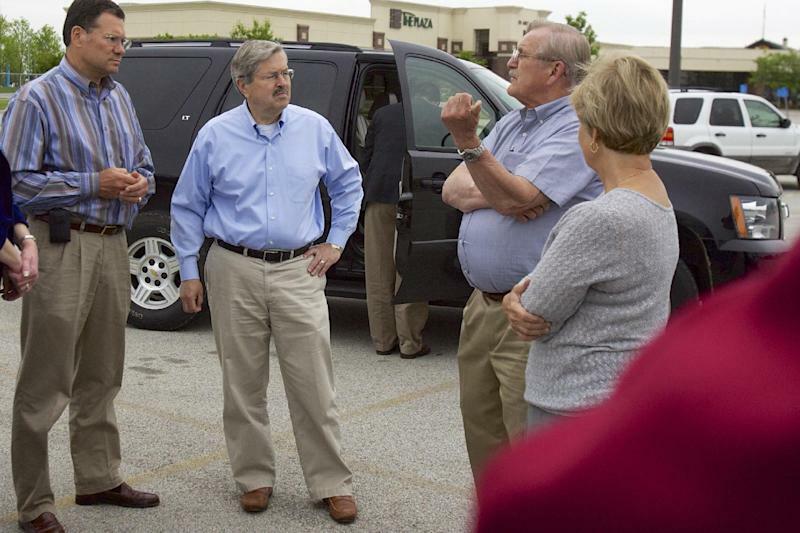 Branstad has made highway safety a priority since retaking office in 2011. Last year, he signed a measure into law that increased sanctions against drivers who pass stopped school buses, and his transportation aides have a goal of reducing highway deaths to zero. Branstad and Lt. Gov. Kim Reynolds were inside the SUV, but were not aware of the incident until Tuesday, governor spokesman Tim Albrecht said. He added that Branstad has "great faith and trust" in the law enforcement officials who drive him throughout Iowa's 99 counties. On the recordings, Hedlund thanked the dispatcher he talked to during the check of the governor's vehicle. "OK, no problem," the dispatcher responded before sharing a laugh with Hedlund. "I feel bad for the trooper," Hedlund said. "That's OK. I'm sure they realized you guys are out there doing your job, right?" the dispatcher responded. Hedlund made a joke about the need for more troopers on the road. Soon, though, he seemed to recognize the significance of the incident. He called the dispatcher back and asked to have the SUV's license plate ran through the system, and again it did not turn up. "Just in case it becomes an issue, I want to be able to, you know, have some documentation ...," he told another dispatcher. Hedlund later called to ask how long audio files of radio traffic were retained and joked that he was "making friends" and endangering his career. "He feared exactly what was going to happen. If he raised that issue, there was going to be some retaliation," Duff said. "He took the weekend to think about whether it was going to be worth it. If you ask him, he'd do it again." The department refused to release a copy of Hedlund's complaint, claiming it was part of a personnel investigation. Albrecht said Hedlund's leave was unrelated to the speeding incident. Hedlund, who worked on the kidnapping and slaying case of two young cousins who vanished a year ago in Evansdale, was recently interviewed as part of a disciplinary investigation that he hopes will allow him to return to work, Duff said.